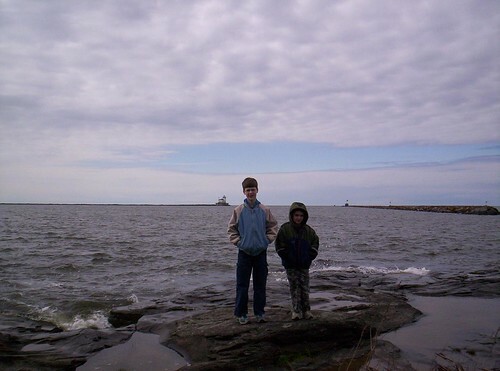 It seems like yesterday, but it was in the spring of 2005 that we made our first trip out to Lake Ontario. We have since been a few times. 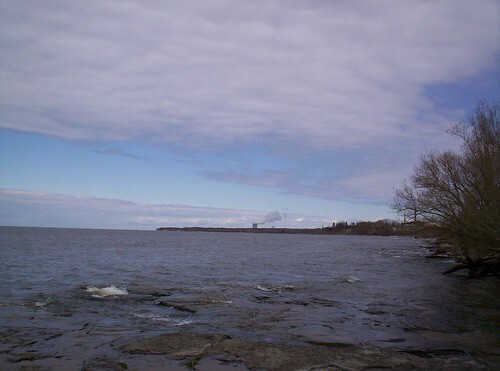 This first trip, we strolled the shores of the lake, and visited the H. Lee White Maritime Museum in Oswego, NY. H. Lee White was born in Oswego, graduated from Hamilton College and Cornell University, was a commander in the Navy and was an attorney in New York City. He was Assistant Secretary of the Air Force in the Eisenhower administration, too! 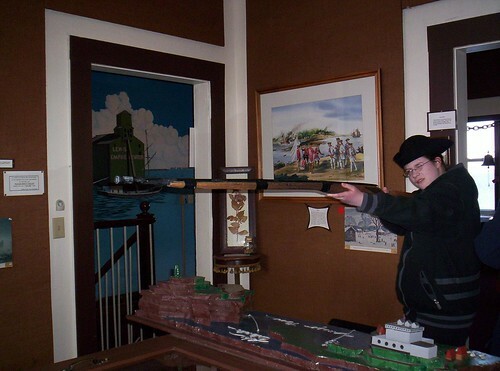 This museum was established to preserve and promote the Oswego Harbor’s importance in our history, with an emphasis on ships, of course. 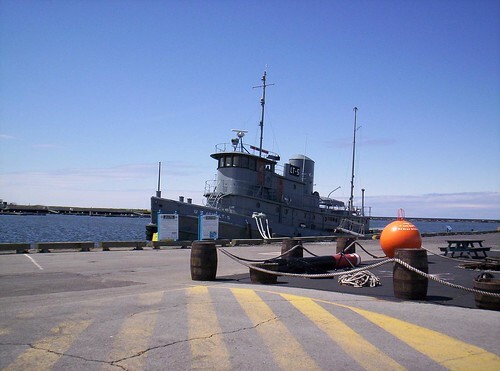 The website says that the museum’s centerpiece is the USAT LT-5, that cute little tug that sat wantonly roped to the pier. When we drew close, we saw that visitors were not allowed on. The ship was built for service during World War II; you can read more about the ship here. 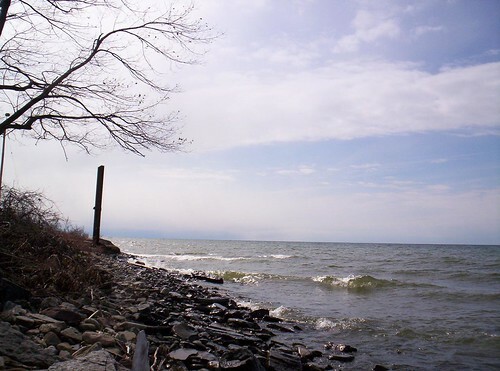 Because we love Lake Ontario so much and found the air so refreshing, we puttered around the pier for a bit, taking in the Great Lake air. Glorious. Just look at that vast sky! The museum looked small and drab on the outside, but inside it is two-storeys- packed full of interesting naval artifacts and history. I was struck by the enormous mural painted across one entire wall. It was painted by George Gray and depicts scenes from early American history here. The portrait of Pontiac is stunning. I was not allowed to use flash to snap a picture. The artifacts were fascinating. 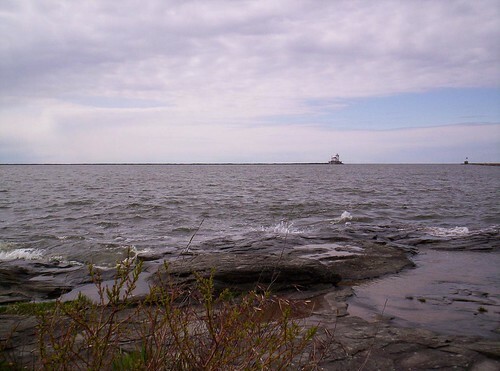 We saw huge rings of chains, giant-sized spools of navy-grade rope, miniature model boats of all sorts, navigational instruments and widgets, navy stripes and badges galore, gorgeous Oswego-ish artwork, and all the little gadgets that accompany life on the lake for the last 300 years. There is even a big signal lamp–with shutters– the kind I saw in that old 1940’s Titanic movie, when the crew had desperately tried to flash Morse code to a nearby vessel. 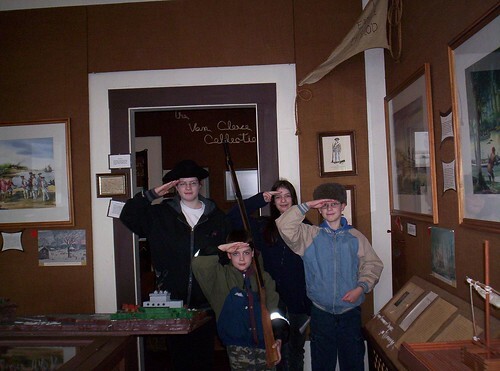 Kids could try on uniforms, test out replica muskets, and wear the ubiquitous tricorn hat of yesteryear. Of course my kids loved it all. My youngest, known for his penchant for finding little places, nearly flipped when he discovered a secret passageway! 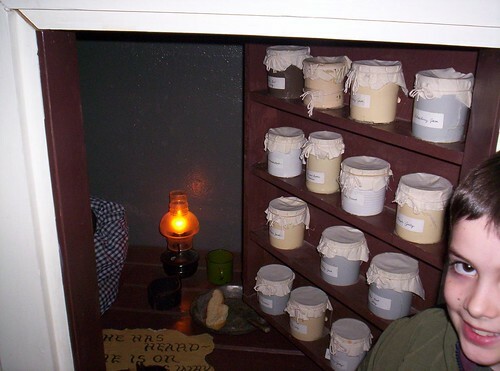 This facade of a jelly cabinet was a secret hiding place for travelers on the Underground Railroad. The museum was put together well. Thumbs up from this crew! After our excursion there, we decided to wander the city a little. 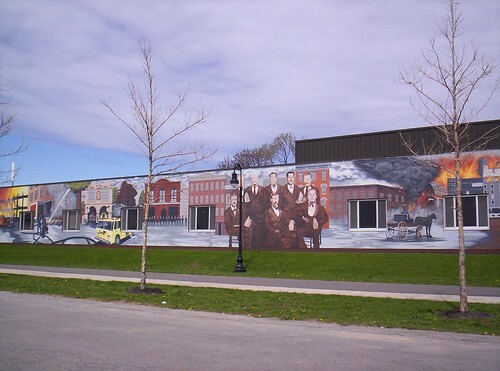 Oswego has some very colorful murals alongside long buildings. 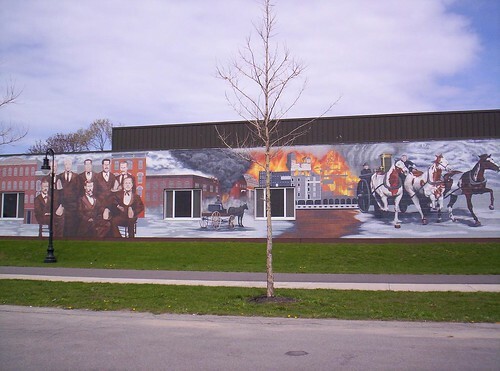 The murals depict scenes of its history, or honor their brave. Historically, there have been some very deadly house fires in the area, and I believe the idea of family life insurance sprang out of such tragedies. The murals depict those who served the community and some who lost their lives doing so. 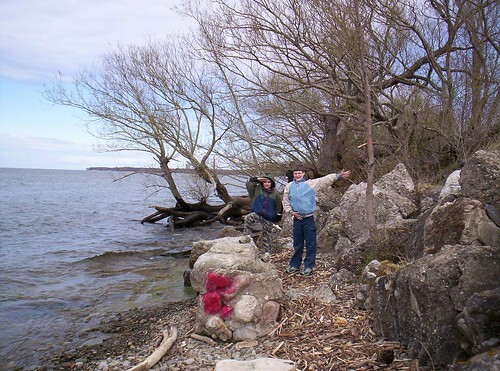 We neared the grounds of Fort Ontario and walked down the railroad tracks. A small footpath led us down to the shore of the Lake. Some rocks were discolored by amateur, uh, “artists” who couldn’t hold a candle to the murals on the streets. 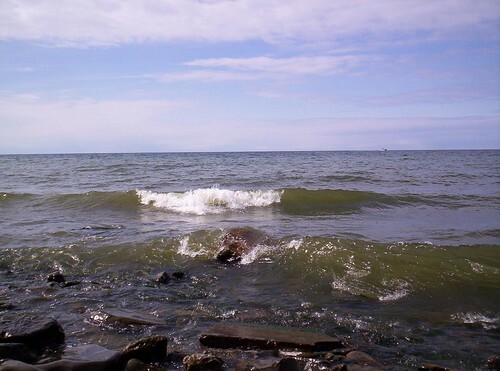 The waves were beautiful. So wild and unpredictable but very elegant. 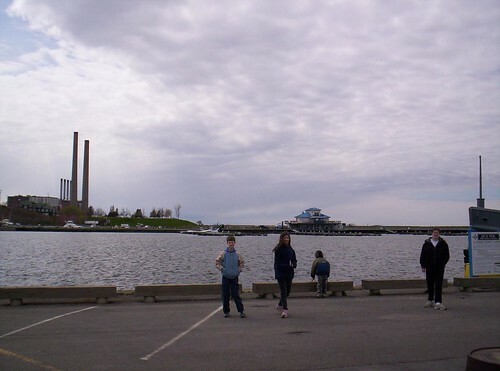 If you squint (or click to enlarge the photo, and squint), you can see the nuclear power plant stack in the background in the first photo, the lighthouse in the second photo, and the buildings of Fort Ontario in the third photo. Back up to the grassy area, a more somber scene befell us. 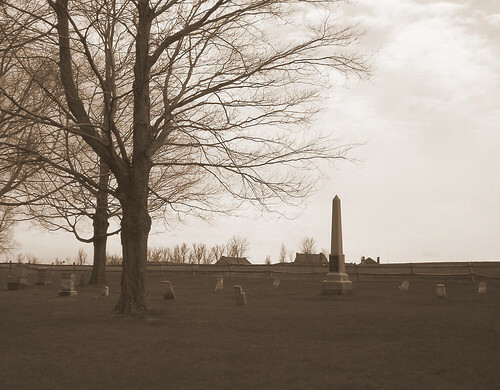 It was the graveyard of soldiers who had died while serving at Fort Ontario, dating back to the French and Indian War. A monument was erected for the “unknown soldier” there. From here, we attempted to gain admission to Fort Ontario (something the kids had wanted to do for a while) but it was closed. Aw! I could only promise the kids that we would return as soon as possible. 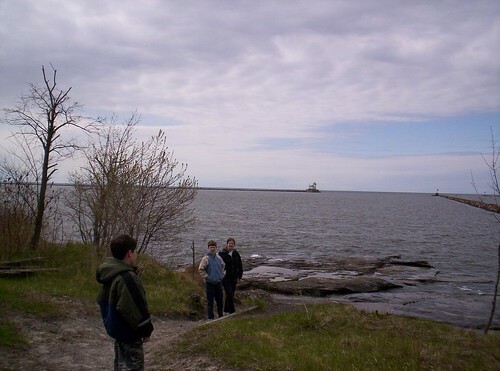 We actually did get to visit the lake once again, and the fort. 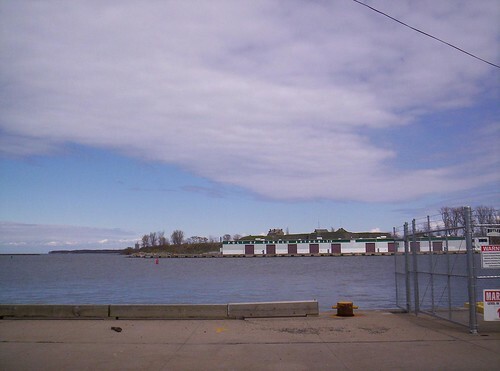 Our visit to Fort Ontario is here, and our visit to the lake again during some blustery winter weather. 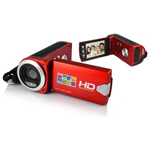 you should look into coming back in july – toward the end of the month. there is a massive festival called harborfest. the firework display is world class. Thanks, Matt! We’ll look into it. It sounds great. Thank you for giving informaation about H. Lee White. My brothers middle name is Lee, and wanted to see if Mr. H.Lee WHite might be related to us. Must take a trip someday to this spot. I’m looking for a picture of the ship, “Oswego” that my grandfather came over on in 1921 from Norway. I’m putting together my family history and was hoping to get a picture of the ship which I assume no longer exists. Below is his information.